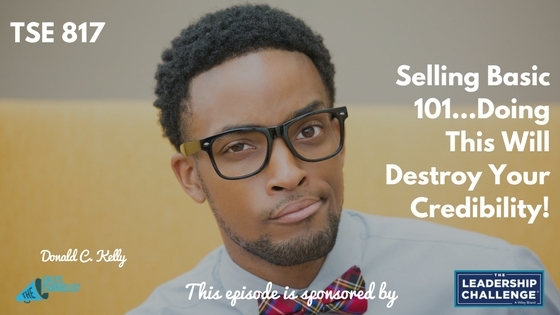 TSE 817: Selling Basic 101...Doing This Will Destroy Your Credibility! 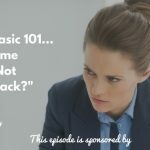 Home » TSE Podcast Post Page » TSE 817: Selling Basic 101…Doing This Will Destroy Your Credibility! If a buyer doesn’t believe you’re credible, he won’t do business with you. Credibility takes time to craft, and it’s incredibly delicate and easy to lose. You must do everything you can to avoid destroying your credibility. 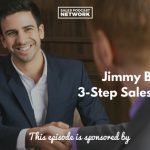 On today’s episode of The Sales Evangelist, we continue our sales basic series with a discussion about how we can change our image from sales professional to trusted advisor. Your prospect isn’t just an appointment. When you operate within a system of quotas or appointments, it’s incredibly easy to lose sight of the people behind those appointments. If you allow yourself to focus primarily on scheduling appointments and you forget about the human beings you’re interacting with, you’re undermining your own credibility. Likewise, if you promise your prospect a solution to a problem, but during the scheduled phone call you mention handing him off to someone else for the solution, you’ll undermine your credibility. He’ll have the sense that you lied just to get him on the phone, and he won’t want to work with you. Communicate to your prospect that you care about what he cares about, and prove yourself trustworthy. Broken promises destroy your credibility. Sales professionals understandably get annoyed when people miss their scheduled appointments. If you’re doing the same to your prospect, and you’re missing scheduled appointments, you’re disrespecting his time. You’ll inconvenience him, and you’ll diminish your own credibility in the process. Instead, prove yourself trustworthy. Keep your prospect’s priorities in mind. When you do break his trust, apologize. I can think of countless times in my career when I could have easily blamed other people for things that broke down in my customer’s process. Instead, I apologized and fell on my sword. If you acknowledge your mistake, recognize the consequences, and apologize, you’ll re-establish your credibility with your customer. We often rely on excitement about our product or service to communicate our intention to the customer. We believe that if we’re excited enough, we can accomplish our goals. While enthusiasm is important, it isn’t enough. We must demonstrate to our customers and establish ourselves as trusted advisors. We aren’t required to know everything, but we must know their business and their problems. Know how he makes his money and understand why he’s losing money. It takes a while to establish credibility but it makes a world of difference. We’re excited about the book Stop Selling & Start Leading: How to Make Extraordinary Sales Happen brought to you by our sponsors at Wiley. It’s a blueprint for what buyers want and the things they hate based upon survey information. We want to help you find more prospects, build stronger value, close more deals, and do big things.